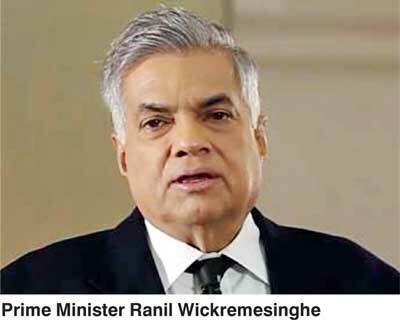 The local government elections that concluded on 10 February 2018 have shaken the ruling United National Party(UNP)to its foundation.The UNP had exuded confidence from all pores of winning the elections at the ward level,exploiting the advantage it had got from a possible split of anti-UNP votes between the newly formed Sri Lanka Podujana Peramuna or SLPP and the old Sri Lanka Freedom Party or SLFP. This strategy again, according to many, was a machination carefully orchestrated by its leadership for quite some time. However, its confidence was totally shattered when it found losing almost all the wards it contested in the Southern part of the island. Had the election been conducted on the format of the pure first-past-the-post electoral system that prevailed prior to 1978, its performance by all means would have been catastrophic. But due to the hybrid system in which 40% of the vacancies had to be filled on the proportion of votes which each losing party had got, it ended up securing for itself2,393 members out of 7,654 or 31% of the seats. This was pretty much close to the overall percentage of votes it had polled at the elections. Again, it has been a beneficiary of the 60 to 40 proportion in the hybrid system, hurriedly introduced at the committee stage to change the original 70 to 30 proportion in the draft local government bill. Had this original proportion prevailed, the SLPP would have been the clear winner at the ward level as well as the overall local government constituency level. In that case, the current confusion over who should rule the local governments would not have arisen. The critics of UNP have been quick to point out that it was a mega defeat which it had suffered at the elections. That was because it was the first time that a ruling party had been swept over at a mid-term election. The arguments put forward by them went on as follows. The ruling party had commanded all the powers and resources to outperform the rivals. These included the budgetary powers, police powers, bureaucratic powers and media powers. The practice in past elections had been that whenever the ruling party violated election laws, the Police and the bureaucracy kept a blind eye; whenever they were violated by the rival parties, the laws were enforced to the letter and sometimes even beyond the laws. Hence, it was unthinkable that the ruling UNP got itself ousted at the elections. But that was also the making of the UNP-led Government. It had introduced legislations to appoint an independent election commission that conducted the elections independently, freely and fairly. Under these arrangements, the ruling party, though it had all these powers at its disposal, could not use them to its full advantage. The laws relating to the display of posters, cut-outs, bill boards, hoardings and even the use of electronic and print media were enforced by the Commission to the letter. For instance, there were even reports of the commission officials intervening when the media were accused of reporting certain matters unfairly. Hence, the voters could vote at the election without being influenced by the powers that had been enjoyed by the ruling party. In such a situation, it was not unusual for voters to vote en bloc to register their protest against the government in power. As mentioned above, the election results map based on the first-past-the-post system has been virtually monopolised by SLPP in the Southern parts of the island. There are some isolated blocks won by UNP and SLFP but they are very small in number. Anyone who looks at the map would conclude that SLPP has been swept into power in the whole island except in Northern and Eastern provinces. In these two provinces, local governments have been captured by minority Tamil or Muslim parties. However, the votes polled or the number of members elected by each party does not show this result. Accordingly, SLPP has polled 4.9 million votes accounting for 45% of the total votes polled at the election. The corresponding numbers relating to UNP have been 3.6 million and 33%. SLFP which contested either under United People’s Freedom Alliance or UPFA or SLFP had polled 1.5 million votes which amounted to 13% of the total votes cast. The Janatha Vimukthi Peramuna or JVP had polled nearly seven lakhs,which amounted to 6% and Ilangai Tamil ArasuKachchu or ITAK had a little over three lakhs or 3%. It is these numbers that have led to different interpretations by election analysts, political commentators and top leaders of political parties. Why did the ruling UNP lose? 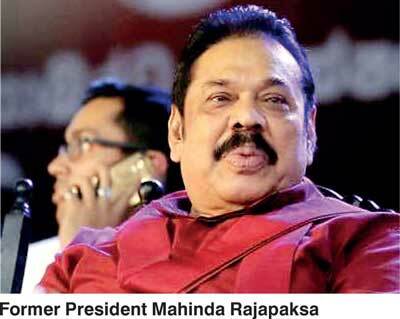 To the general public, it is clear that the ruling UNP and SLFP have been routed at the elections. Their vote in large numbers in favour of the newly-formed SLPP to make it the winner at the ward level could mean only two things. First, it is a protest against what the Government has done or failed to do during its three-year existence. Second, it could also be read as an endorsement of the ideology that was put forward by the new party SLPP. Either way, it teaches many lessons to those in power as well as those who aspire to capture power in the future. Failure to take note of those lessons and act accordingly would certainly be catastrophic for the ruling UNP, on one side. Getting exhilarated by the unexpected win and acting on the false confidence that voters would inevitably return them to power at future elections too would be self-defeating for SLPP, on the other side. These are two pitfalls to which either contender at the next general election scheduled for 2020 could easily fall. It is in their interest to avoid this by all means. It requires both parties to adopt a different post-election strategy. In the case of the UNP, it should sit back and give serious thought to analyse why it lost at the elections despite its superior powers over the rival parties. The SLPP on the other handshould ponder why voters selected it to register their protest against the UNP and how it could continue to earn that confidence from them. But instead of doing it, both parties went on an enterprise to twist numbers and posit a position favourable to them. Both these enterprises are wrong. The SLPP used the numbers to show that it has received a mandate from the people to form a new government. 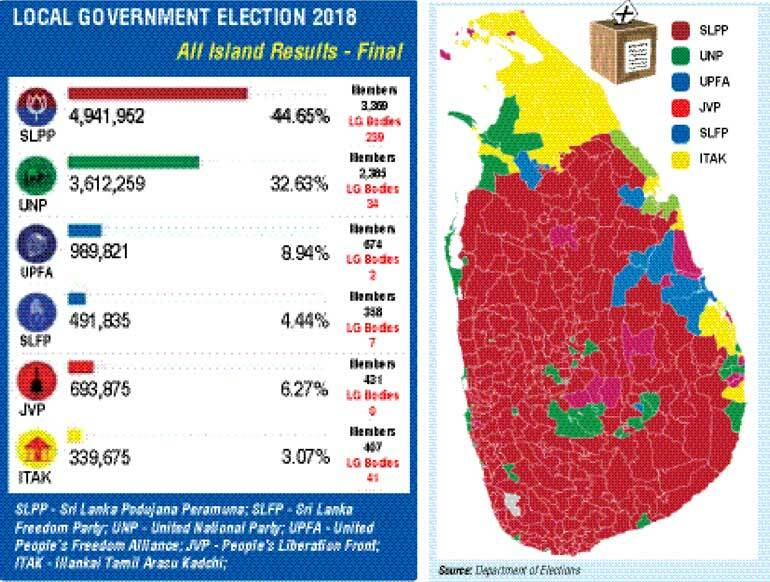 The UNP, on its side, tried to twist the numbers to show that it has still retained its vote-base and the SLPP, led by former President Mahinda Rajapaksa, has not registered a win at all. It even went further to demonstrate that the vote-base of Mahinda Rajapaksa has been shrinking compared to what he had got in his best contest in 2010. If this trend continues, the UNP was happy to note that Rajapaksa would never be the winner in a future election. These analyses done by both parties certainly help boost the morale of their supporters. But they would not help them to win future elections. That is because the twisting of numbers in this manner for personal gain is not in accordance with hard economic laws. They have to fight future elections in terms of hard economic laws relating to social behaviour. Social behaviour, unlike a machine which would go on a set course once it is activated, will be unpredictable since it is governed by complex possibilities occurring in a non-linear world. Those who have twisted the numbers have assumed that the world that gives rise to social behaviour is simple, linear and could be predicted accurately. This is certainly a mistake. 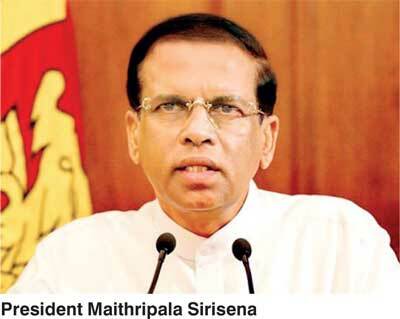 Those who have joined the number twisting game from the UNP have added the votes polled by parties which were sympathetic to the candidacy of the common candidate Maithripala Sirisena at the historic presidential election in January 2015. At this election, the incumbent president Mahinda Rajapaksa was defeated despite that all the odds being in his favour throughout. Those who have rallied around Sirisena managed to defeat Rajapaksa by a majority of some four lakh votes. This is an event in social behaviour and it is illogical to expect that it would be repeated or not repeated in subsequent elections. It will depend on many factors that are enshrined in what is known as the Laws of Nature. These laws are different from the laws of people or laws of legislators. While the latter category can be controlled or changed at will, the former will occur naturally with the configuration of the right conditions at appropriate times. There are four such Laws of Nature occurring one after the other and one leading to the other. The first is the law of impermanence depicting that nature does not uphold permanent existence of anything. Everything under the sun is subject to continuous change: they occur, exist and die. Social behaviour is also subject to this law. Social movements arise, exist and finally die away. Hence, the outcome of the election in January 2015 was such social movement: it occurred, existed and died away. Similarly, the outcome of the local government election of 2018 has occurred, existed and will soon die away. They cannot be used to predict how people will vote at future elections. The second Law of Nature is the law of cause and effect. Everything under the sun occurs due to a cause. That cause then gives rise to an effect. Then that effect gives birth to another cause. And that cause leads to another effect. In this manner, it is a chain of causes and effects that governs all natural things in the world. And the subsequent effects are different from initial effects. Eventually, what becomes of the natural world is completely different from how it started at the beginning. This cause and effect then brings forth another Law of Nature, known as the law of evolution. Evolution does not generate a completely new one; nor does it generate a completely different one either. Both what was there before and what is there after are linked together like the links of a chain. But they are in essence substantially different from each other. This is therefore the logical outcome of the two other laws discussed previously, namely, the law of impermanence and the law of cause and effect. The message it gives is that nothing remains permanent and everything is subject to continuous change. The fourth law of Nature is the law of unity, meaning that though we as laymen make discriminations about what is around us, there is only one unique feature in nature. Therefore, one cannot say whether what has evolved is good or bad. It happens as to how every cause has given rise to effect and every effect has in turn become a cause for another event. Now back to the game of number twisting made by political leaders and some election analysts. They have assumed essentially a social event fixed in time. The local government election in which people participated happened to be a social event that has occurred at a particular point in time. To assume that it would be repeated subsequently is simply ignoring the prevalence of the Laws of Nature. When one allows the clock to tick, which economists have named allowing the dynamic world to rule us, all the four laws gets activated automatically. Then the election results become impermanent, give rise to a series of causes and effects leading to a continuous evolution of things around us and settling finally at a point where we are unable to say whether the latest outcome is good or bad. If we also have evolved along with the evolution of the natural things, surely we would find the evolved thing acceptable at that particular point of time. Then again it becomes impermanent, driven by causes and effects leading to another evolved state. This is a chain and that chain cannot be controlled or checked by the laws of people. Why doesn’t the crème admitted to universities pass out with first classes? This could be illustrated by means of an example. Universities in Sri Lanka admit the crème of the students who have passed the admission examination, the GCE Advanced Level examination. If this social event is repeated, all these students should pass out from universities with first classes. The experience shows that only about 5% of them would accomplish that feat. Why is it? That is because when dynamic dimension is allowed to play, these students are all subject of the Laws of Nature. They would rearrange their social behaviour and the final performance would be completely different from their original performance at the AL exam. Elections also occurring with time intervals will display this phenomenon. Accordingly, today’s winner will not be the winner at an election that would be held in, say, some two to three years’ time. By that time social behaviour will be rearranged giving rise to a new set of outcomes. However, if there is an election immediately after the just concluded local government elections, its results would be substantially influenced by the outcome of the local government election. That was the rationale behind the SLPP calling for a general election immediately and the rationale behind the ruling UNP trying to buy time by ignoring that call. Thus, the number twisting game played by leading politicians is simply an exercise done to gain self-satisfaction. Instead of investing their time in this unproductive enterprise, they should have gone into the causes for the losses or gains and the resultant effects of such causes. The correct identification of this process would certainly help them to master the correct strategies to face the subsequent elections. In the next part we will look at why the UNP lost and the SLPP won.